When Chris Christie took questions from a crowd during one of his Thursday town hall meetings, one tiny person, with a big question, stole the show as she directly asked the New Jersey Governor when he planned on fixing her house. Several hours later, three-year-old Nicole Mariano again stole hearts, joining "Piers Morgan Live" to discuss her family's home, which remains damaged following Hurricane Sandy. Seated on her mother's lap, Mariano smiled coyly at the camera as Piers Morgan sought specifics about her living situation. For the first time in his adult life, the man that preaches a good day’s work, is unemployed. 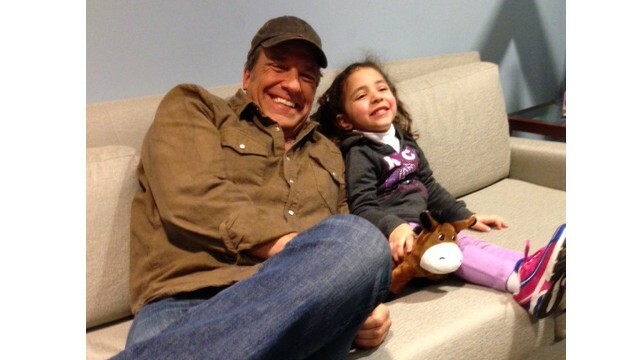 “You know, it's odd,” said Mike Rowe, joining "Piers Morgan Live" Thursday evening. “But I mean seriously it forces you to step back and go, 'okay. I've been really, really lucky – I know that.'" After ten years on Discovery Channel’s "Dirty Jobs" and serving as a commercial spokesman for Ford, Rowe has currently been under social media scrutiny for his narration in a recent Walmart commercial. He is the founder of the mikeroweWORKS Foundation, which provides scholarships in partnership with Scholarship America to fund those interested in jobs specific to a skilled trade. On Morgan's prodding, Rowe proudly belted out a sampling, with his deep vice pulsating through the "Piers Morgan Live" studio. Click the above video to enjoy Rowe's vocal aptitude. Longtime pals and collaborators, Christopher Miller and Phil Lord joined forces to write and direct the smash-hit movie that sees the world through the eyes of what Fortune Magazine dubbed “the toy of the century”: Legos. “I don't know that we ever thought it was going to be this crazy popular but what we thought was, you know, it could be kind of fun,” said Miller, joining Piers Morgan on Thursday. Friends since their college days at Dartmouth, Miller and Lord said they approached making "The Lego Movie" the same way they worked on former hits, including "21 Jump Street". “We just try to make each other laugh,” Miller said. Reblogged this on Hannah Terjemah, Jasa terjemahan, Goole penterjemah, Jasa translate, Jasa translate artikel, Jasa translate online, Jasa terjemahan bahasa inggris, Jasa translate bahasa inggris, Jasa penerjemah.